Big Finish: Doctor Who - THE TWO MASTERS Review | Warped Factor - Words in the Key of Geek. Tony grows a pointy beard and laughs maniacally. Fact 1: If you call a story The Two Masters, you’re going to raise a tsunami of squee from fans both young and old. Fact 2: If you call a story The Two Masters, you’re going to have to deliver at a level at least equal to every fan’s imagination of what such a story could be, or there will be Muttering about you forever more. Fact 3: John Dorney’s The Two Masters delivers above expectations. Buy it now. 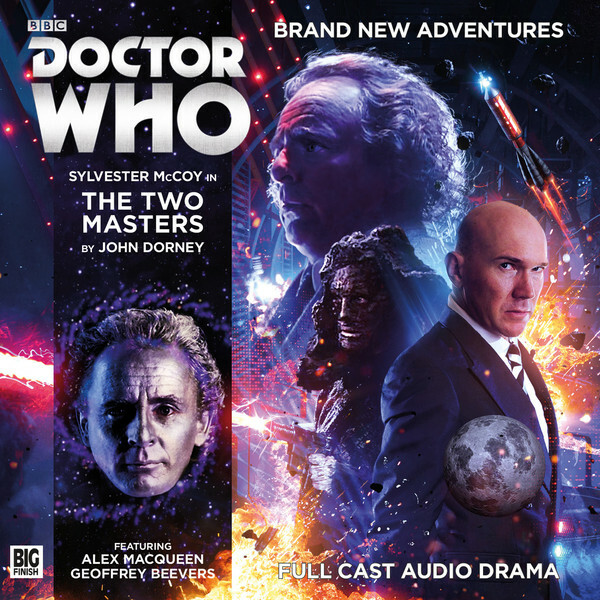 The Two Masters trilogy has been an exercise in tension-building, and has staked a claim to the title of ‘Best Big Finish of 2016’ – And You Will Obey Me gave Geoffrey Beevers a chance to stretch muscles that his Master rarely gets a chance to use, and Vampire of the Mind let Alex Macqueen notch up another Doctor and play his dancing mad Master up against the ‘circus clown’ Sixth Doctor, with joyful, explosive results. But we all know that as good as the first two instalments were, it’s this one we’ve been waiting for, slavering for, positively hungry for. We’ve known what multi-Doctor stories have been like for decades, but a multi-Master story? Oh to the absolute ever-loving hellyeah. What’s more, in Beevers and Macqueen, we have two absolutely stunning incarnations to play with, each with a very distinct personality – a fact that Dorney toys with openly throughout The Two Masters. That said, right from the off, the Beevers Master here seems enlivened, excited, much more like his future self than he usually gets the chance to be. With a voice like his, it’s a delight to hear Beevers get the chance to let rip a little, and it shows the conscious decisions he makes about his Master in any given script. Macqueen’s the future Master? Are we sure of that, in the Master’s convoluted timeline? Well, yes. While never entirely giving anything as dull as a straight answer, The Two Masters does essentially establish that the Macqueen Master is at least a later version than the Beevers incarnation. And then there are shenanigans to account for the Master’s recent issues, both in terms of the Tardis damage that delivered the pretext for And You Will Obey Me, and the personal knowledge-gaps he was suffering in Vampire of the Mind. Along the way, it’ll make you want to listen to both of those stories again, to see if you can spot the shenanigans at work. Telling you too much about the actual plot of The Two Masters would absolutely spoil it for you – there are delicate webs of storytelling in Dorney’s script, and if you twang the wrong thread, the whole thing lights up like a Christmas tree. But there’s some solid mythos-invention here that will make you want to know more, much more, about someone called The Heretic and his breadth of imagination. If you remember the first time you heard the name Omega and thought ‘Oh, he could really be something,’ prepare for that same ripple of pleasure down the spine, because that’s the territory you’re in. There are joyful notes of recent self-mining too – it’s a spoiler, but not an important one, to tell you that episode one involves the Rocket Men. They’re not central to the plot, but they’re a lovely nod to the recent past of both the Beevers Master and the Doctor. Beevers, as we’ve mentioned, is absolutely on fire in this story, perhaps conscious of its power – the very idea of two Masters being aware of each other and first battling against one another and then teaming up to conquer the universe is such an irresistible fanboy concept that you have to go above and beyond to deliver it with the right power, or it feels, like The Two Doctors did, like a potentially great story idea wasted. Beevers is not about to let that happen, and listening to him in this story – well, let’s say this. Geoffrey Beevers has become one of the most iconic Masters, through the power of stories like Dust Breeding, Master and Mastermind. This performance and this story is absolutely up there on that level. I mentioned the whole ‘buy it now’ thing, right? Macqueen too has more than carved his niche into the Master’s legend, and while at the beginning of this story, he’s a little more restrained than usual – a conscious bringing together of the two Masters’ personalities, Beevers more playful, Macqueen more straight – this is one of Macqueen’s finest outings in the role too, up there with UNIT: Dominion and some of the better Dark Eyes storylines. Of course if you’re going to have two Masters, and an actual plot, rather than just a lot of bickering, something’s got to give, and it’s absolutely spot on that in this story, what gives is the Doctor – McCoy’s Doctor is very much a buzzing fly in the Master’s life in this story, and there’s a conscious flipping of the focus. As the Beevers Master actually says here, ‘You flatter yourself that you’re my nemesis, the Moriarty to my Holmes.’ That sense of the Master being the hero of his own life is adhered to strongly, with the Doctor turning up at the start because the Master engineers his arrival, and at the end because he’s the great villain, interfering with the Master’s plans at the last possible moment. It’s a beautiful conceit, and it works absolutely, shifting the focus from our quirky saver of universes to the master of evil as its prime mover. Dorney’s gift for dialogue is positively turbo-charged throughout this story, and there are moments not to listen to if you’re eating or drinking. Having the Master describe the Fifth Doctor as ‘the drippy blond one, dresses like no-one who ever played cricket, ever,’ is just a sublime sample. Dorney has the courage to make the Master puncture some of the ‘tawdry quirks’ that we as fans have always just accepted as part of the Doctor’s personality, and it’s both sublime and right that he should have the power to do that, the power to see the Doctor not through the rose-tinted glasses of fandom, but as a tedious inevitability in the universe. Nor does he let his other self go unskewered, which honours the spirit of multi-Doctor stories while delighting long-term Master fans. One word of warning: you’ll want to keep your wits about you listening to this story. As the Doctor remarks at one point, it all gets ‘needlessly’ complicated, and there’s almost a game of ‘Find The Master’ going on through the mid-section, when things are very unlikely to be what they seem, but the ‘needless’ complexity is actually what makes sense of not only this story, but the whole trilogy, and once you’ve twisted your brain through a couple of corkscrew revolutions, it becomes a deeply satisfying driver of the plot. Bottom line – there are some Big Finish stories you absolutely need to own. If you’re a Master fan (and who isn’t? ), they include Dust Breeding, Master, Mastermind, UNIT: Dominion – and now The Two Masters. It’s a superb story that perks up your brain and makes you realise the quality of the actors we currently have portraying our audio Masters, and in John Dorney, the quality of the writers we have telling their stories too.